Mud Clock – Bring In The Robots! This is a fun little project kit I put together a while back. It’s basically a fancier version of a potato clock, where two different metals are inserted into something that can conduct electricity, thereby causing a (small) bit of electricity to be generated. 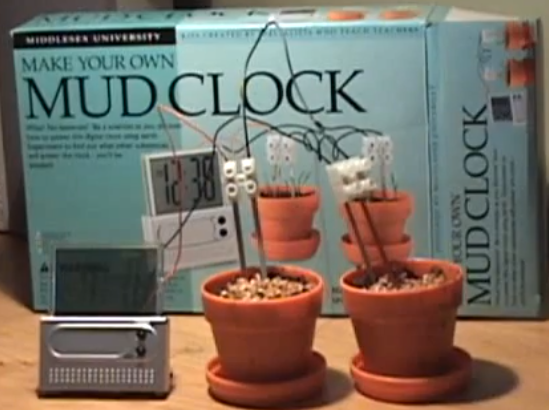 In the case of the mud clock, two pots are used to double the output power of the created batteries, so that it will power a small digital clock. Note that the power does not actually come from the dirt (so sad!) – it’s the chemical reaction between the two different metals that provides the power. The dirt is just there to allow the electrons to move from one metal probe to the other.